How you handle global tax issues can make or break a deal. When a business engages in a multinational merger or acquisition, dealing with a diverse set of transaction-related tax rules is one of the major challenges to successful implementation. PricewaterhouseCoopers' Mergers and Acquisitions: A Global Tax Guide helps you navigate the complexities unique to these international deals. 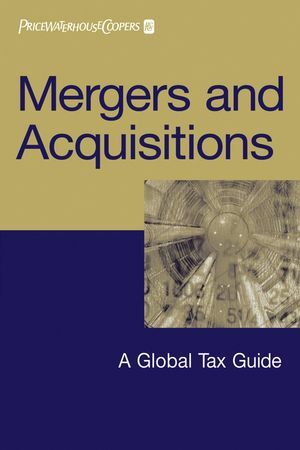 This invaluable guide focuses on the global tax aspects of mergers and acquisitions to provide you with the information you need to move the deal forward-under a variety of circumstances and in numerous markets. Presenting individual chapters for each of thirty-one countries, this essential handbook provides quick access to the tax information you need, and, as much as possible, reduces the effort required to compare the rules that apply in one jurisdiction with the rules that apply in others. Each country-specific chapter includes an overview of the general approaches to mergers and acquisitions taxation issues as well as detailed information about how the tax authorities in each country apply the rules to various aspects of a transaction. PricewaterhouseCoopers' Mergers and Acquisitions: A Global Tax Guide offers tax planners a foundation of information that they need when involved in international mergers and acquisitions. It also covers many of the finer points of the broader tax issues that arise during planning and negotiation. Many will find this valuable reference to be an indispensable desktop tool in their effort to gain a deeper understanding of the global tax environment. PricewaterhouseCoopers (www.pwc.com) provides industry focused assurance, tax, and advisory services to build public trust and enhance value for its clients and their stakeholders. More than 130,000 people in 148 countries work collaboratively using Connected Thinking to develop fresh perspectives and practical advice. PricewaterhouseCoopers refers to the network of member firms of PricewaterhouseCoopers International Limited, each of which is a separate and independent legal entity. Taxes: Deal Making’s Forgotten Value Driver. Financing and Hybrids: Maximizing Your Tax and Legal Structures.